Buy now! – 8oz (250 grams) Bledie Lekker authentic Karoo style biltong snapsticks made with 100% USDA approved beef. Our award winning recipe starts with a batch of our proprietary blend of spices. Our select USDA approved beef is cut, cured and hung to air dry with tender care. Each pound of our bledie lekker biltong is then selected and packaged to order. 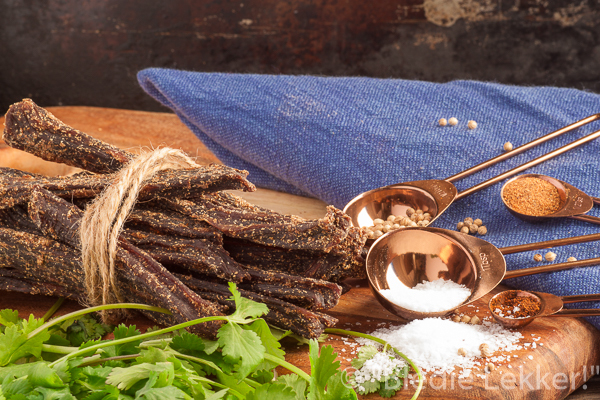 All Bledie lekker biltong is gluten free and free of artificial flavorings. If you have questions please contact us at [email protected] or call us at 704-849-2660. Our business hours are East Coast Standard Time 10am-4pm Monday through Friday, Saturday 10am-3pm.